Today was my second opportunity to volunteer at the slave cemetery archaeological site at Mount Vernon. The slave cemetery site is active on almost every Friday and Saturday during the summer and into the fall. This time is special though because my wife Jayme is here for several days. She has a social studies education degree and also has an interest in archaeology. We woke up early on Friday morning and reported to the Mount Vernon Archaeology lab for work at the site. My parents fly in this afternoon for graduation tomorrow so Jayme and I are able to work at the site the first half of the day until we need to get cleaned up to pick up my parents at the airport. When we reached the site Jason, the site crew chief, assigned us areas and groups in which to work. I started working with a Marine on his day off and Dave, a consistent volunteer which whom I worked last week. We continued to work on the grid that we worked on last Friday. Last week we removed the top layer of topsoil in a new grid and now we were working to level off the grid. The ground penetrating radar results from 1985 showed that part of a burial shaft should be located in this particular corner of the grid. My task was dry screening the soil we removed from the grid. This was what I did last week most of the day at the site so it felt comfortable. (Here is a video of the dry screening process.) We look for any items that looks as if it should be saved - most pieces of stone what look as if they have been altered by man in making stone tools. All of these are kept and placed in an object bag which goes back to the archaeology lab with all of the details of where it was found. 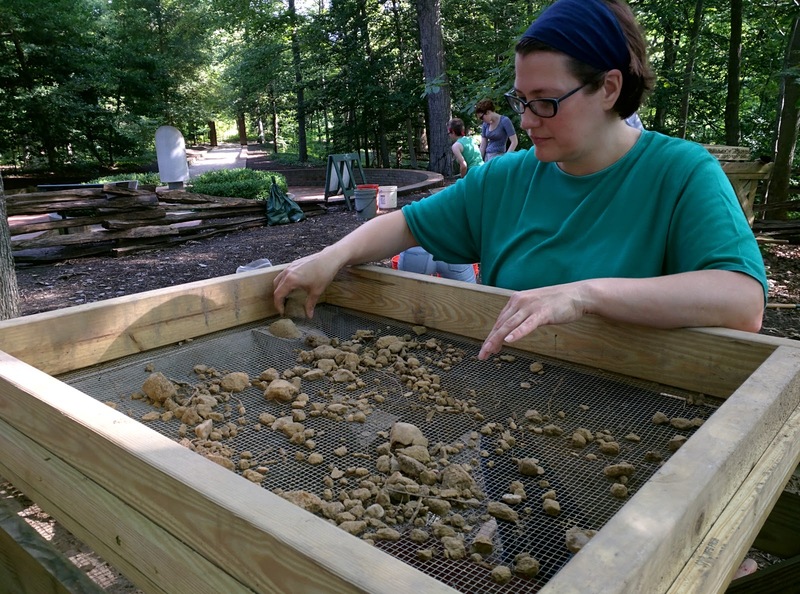 Jayme was assigned another grid on the site and did much of the same work - dry screening soil taken from another grid at a screening table. We checked on each other throughout the morning to see if the other had found anything. Both of use were finding these "flakes" but nothing like a complete projectile point. About halfway through the morning, Jason moved me over to a new area where I worked with a married military couple. Our task was to start work on a new grid separated from the area already being excavated. First we had to use a square shovel to cut through the grass and topsoil and make a grid which would allow us to remove the topsoil easier. This process takes a lot of time and once the dirt is removed it takes a long time to dry screen because there are a lot of roots and organic material on the top layer. We did continue to find the signs of human activity in the form of "flakes" from tool making over a thousand years ago. Jason mentioned that the site is somewhat unusual since it is location near the Mount Vernon mansion that has been relatively undisturbed over the years since it was a cemetery but you also often find flakes and projectile points on the surface since it is on a hillside and there is erosion and wash down the hill. Jayme and I had a great day volunteering at the site and were happy to contribute to the work being done on the slave cemetery survey site. We look forward to keeping an eye on future work at the site and the findings in years to come. After cleaning up - archaeology is hard work - we took the bus and Metro into DC to pick up my parents as they landed at Reagan National Airport. 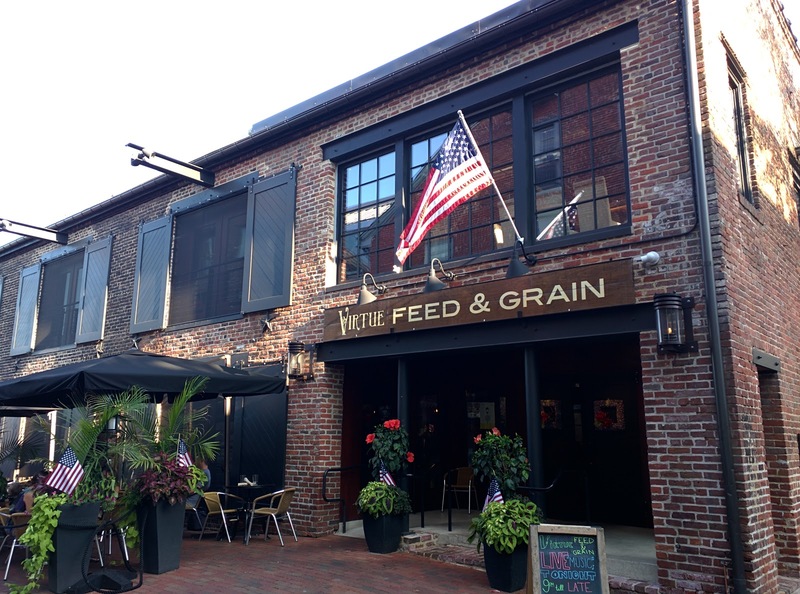 They are staying in Old Town Alexandria during their stay here so we ventured out to have a great meal in Alexandria. Jayme and I so enjoyed our meal the previous night at Virtue Feed and Grain that we made reservations to take my parents there tonight. After a wonderful meal we went on a night Potomac River cruise to see the monuments by night. It was a great night to be on the water. We had a great night in Alexandria and then went back to get a good night's sleep before the day which awaits us tomorrow - graduation.